So, after filling in the frets and re-shaping the neck, the next step was to remove the thick finish (and black paint) from the body of the bass. I was also going to slightly reshape the body, mostly to allow easier access to the upper frets as well as to soften and round out the edges a bit. The stripping/sanding of the body took a lot longer than I expected. 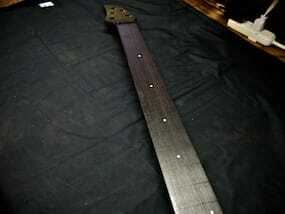 In December 2004 , I had done this on a black Ibanez six string bass, and it was a relatively quick process. 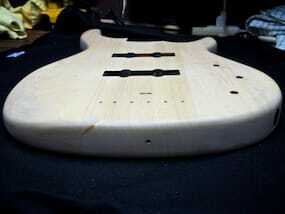 But with this bass, the finish was much harder, and much, much thicker, so it took forever. I ended up having to buy a sander (I bought a Milwaukee ¼ Sheet Palm Sander) which worked great, but it was still a very time-consuming process. Actually, it took a little over eight hours in total just to get the finish and paint off and then a couple hours more to shape the body and sand it to a smooth finish. Wow. 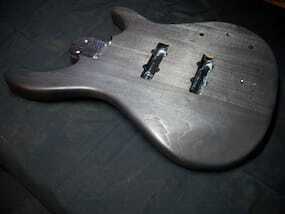 Here’s the bass body after being stripped of the old finish. If this doesn’t look like Agathis to you, and you think you know what it is, let me know – thanks! 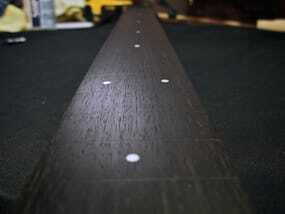 I used an ebony black analine water stain from Lee Valley and it was very easy to apply. You only need twelve hours between each coat, and after each coat, I rubbed it very lightly with #000 steel wool. The directions for the dye say you need to let the final coat dry for 24-48 hours before applying the finish, but after letting some intermediary coats dry for 24 hours, I think letting the final coat dry for at least 48 hours will be the way to go though. 24 hours for sure won’t be enough. 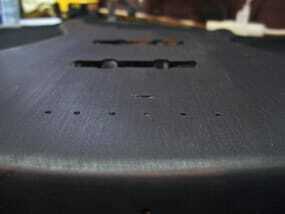 Here are some photos after 3 or 4 coats (I can’t remember how many) of the black analine dye. This isn’t final though – after these photographs were taken, I applied one last, final coat of dye and I’m going to let it dry for at least 48 hours before I start applying the urethane gel finish. While letting the last coat dry overnight, I was starting to question whether I would need one more coat of the dye, but after looking at the bass this morning, I think it’s perfect now as it is. 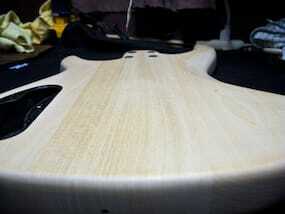 24 hours more drying time, and it should be ready for the finish. Now that the whole bass (headstock, neck, fingerboard, body) is all black, it made sense to also change the hardware to black. 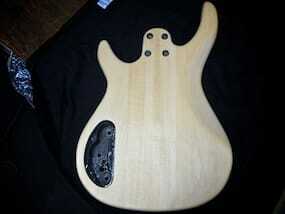 I’ve decided I won’t be keeping this bass, instead I’ll be selling it (for a profit) as soon as it’s done. It really is a great bass though, and I know I’ll have a hard time parting with it once it’s done, but I intend on using that money to make a new five string fretless bass from scratch (well, sort of). Hm. Naturally, I didn’t buy the hardware I would have bought if I was going to keep the bass (which would have totaled $350USD) but I was able to find really good black hardware for the bass for just a little over $100USD. Mind you, the bridge I ordered from AllParts is out of stock, so I’m still waiting to hear back from them on other bridges. They seem to be taking their time getting back to me though. Terrible. 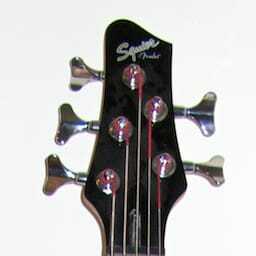 First, I still haven’t heard back from AllParts re: the bass bridge. I sent them a couple emails now and no response… I’m considering powder coating the current bridge instead – I’m waiting to hear back from a couple powder coating companies in Calgary to see if they’ll do it, and what the charge would be, and then I may cancel my order for the bridge. Hm. I should be receiving the black tuners tomorrow, (tracking via UPS), which I ordered from another company at the same time that I ordered the bridge from AllParts. As for dying the body black, I went to check on the bass this afternoon – it should have been completely dry and ready by then, and it was. 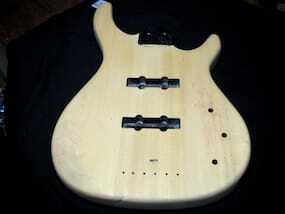 But I noticed a couple sanding "flaws" that were bugging me, especially on the bottom of the bass. So I sanded them down a bit, and then ended up sanding down the whole bass again – first with 320 then 400 grit sandpaper. I followed that with #00 steel wool and then #0000. I had to sand down quite a bit in order to remove some of the imperfections, but the whole bass is smoother than silk now. I made extra sure that it was perfect. As a result, I’ll be applying 2 or 3 more coats of dye now, so the bass won’t be ready for the finish to be applied until the weekend some time. I’m glad I did this though, it would have bugged be down the road if I didn’t. Now it looks even better than before – seriously like silk. Received the tuners and knobs yesterday :-) Still waiting to hear back from either AllParts or from a Powder Coating company in Calgary. Hm. The dying process is taking longer than I expected. Have to be patient. I think the last coat will go on tomorrow, then the finish can go on starting Tuesday. Oh yeah! I almost forgot. In order for the dye to not bleed when putting on the urethane gel finish, I’m sealing the wood with a Tung Oil Sealer first. One more step, but necessary. Fretless Bass Conversion… Part III was published on Tuesday, April 28, 2009 at 2:16pm MDT by Daniel Menjívar and last updated on April 11, 2018 at 9:30pm UTC .